To celebrate the Spiel des Jahres award and to thank you for taking the ride with us this far, we recently sat down with Alan Moon and created a small, limited-edition expansion pack called Mystery Train. This is a free set of bonus cards that adds new variety to the gameplay, and will help get you through the winter while we work hard on laying the tracks to the next volume in our train adventure, Ticket to Ride Europe™. Mystery Train introduces ten new cards to the game. 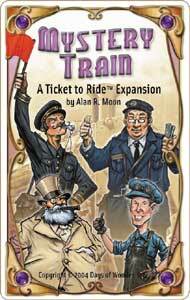 A few are new Destination Tickets; a handful are special bonus cards with a twist; and at last one is a nod to the game's "Engineer", Sir Alan R. Moon! The back of these cards has a distinctive color, as an incentive for players to draw more cards... at the risk of getting an additional destination! 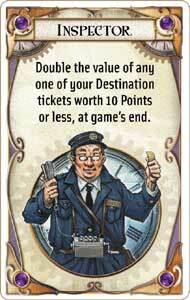 All the rules necessary to play with the Mystery Train expansion are included on the two summary cards. We want you to make the game your own though, so don't hesitate to experiment and put new ideas on our forum.